This week proved to be quite interesting for the Bitcoin casino scene. 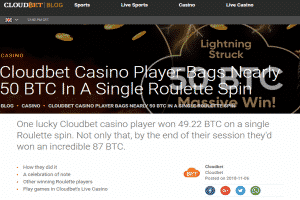 Not only did we saw a Roulette player bank over $500,000 in BTC while playing Bitcoin live casino games, but we also saw the release of two new Bitcoin slot tournaments at Bitcasino. Like always, we’re bringing you all the details about both updates, so keep reading for more info on how you can win some extra money this weekend! While most people were off to a slow start at the beginning of this business week, one lucky player at Cloudbet Casino just experienced the best week of their live. After joining a live Roulette game back on Tuesday, this unidentified punter was able to work the table with great luck, first hitting a big win and then investing that prize to win even bigger. The lucky game this punter chose was Lightning Roulette from Evolution Live Gaming. After betting on the table for some time, the player hit the mother lode on one lucky spin, earning an impressive 49.22 BTC on a straight bet that was supercharged with 500:1 odds. Not one to stop a lucky streak, the player then continued wagering until that big win was almost doubled. At the end of the session, the punter clocked out with a huge 87 BTC, or approximately $552,236 in current USD value. If you haven’t played it before, Lightning Roulette is a unique live Roulette game that offers additional payouts via randomly selected lucky numbers, the value of which ranges from 50x to 500x your stake! However, it isn’t the only lucky Roulette variant offered at the casino. 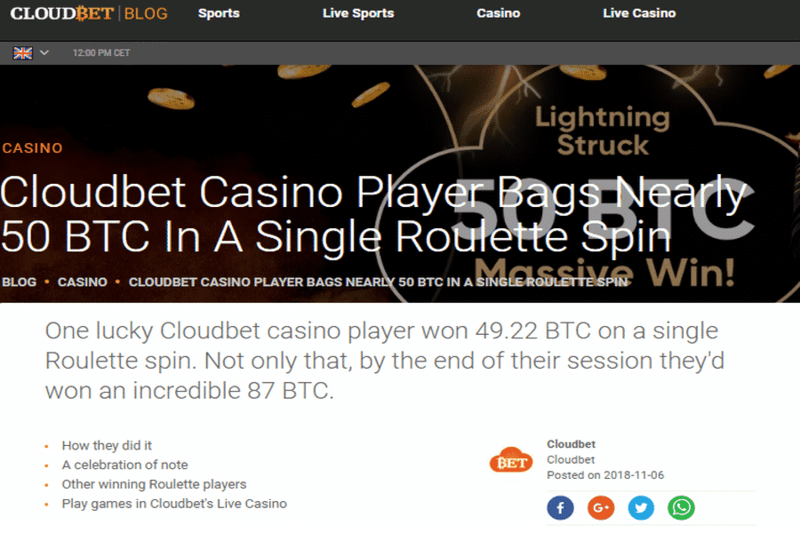 Only two months ago, in September 2018, another punter hit a large payout of 53 Bitcoins at Cloudbet Casino by playing at a different live Roulette table. If you are a fan of Roulette games and are feeling particularly lucky these days, make sure to visit Cloudbet Casino for a chance to hit a jackpot of your own! Starting off this month on a proper note, Bitcasino is running two new slot competitions for its registered players. The first tournament is called the Max Quest Treasure Hunt and it will run from today, November 9th, to Friday November 30th at the casino. To take part in the promotion, you just have to play BetSoft’s new Max Quest: Wrath of Ra multiplier slot game. This First Person Shooter/ slot hybrid will have you shoot at zombie mummies to earn points and trigger prizes on your screen. Each time you accumulate 100 points, you’ll get one ticket for the special €50K prize draw. At the end of the promotion, prizes will be given to 1,770 players across networked BetSoft casinos. The smallest rewards that can be won are only 1,78 μɃ, or €10, while the three luckiest positions will get prizes of €5,000, €3,000, and €2,000 in BTC equivalent, respectively. And apart from this tournament, Bitcasino is also running a second one that will end this Sunday, November 11th, and pay 2,000 different prizes to the luckiest participating punters. Learn more about both competitions when you go to check out Bitcasino.